In the Flat Field is the debut studio album by English post-punk band Bauhaus. It was recorded between December 1979 and July 1980, and was released on 3 November 1980 by record label 4AD, the first full-length release on that label. The album is considered one of the first gothic rock records. Following a 30-date tour, Bauhaus went to Southern Studios in London to record their first album. As the band had a clear conception of what they wanted the record to sound like, they opted to produce it themselves. While most of the album was completed with the planned release date of September 1980, the group found it difficult to record a version of "Double Dare" as good as the one they performed on disc jockey John Peel's BBC Radio 1 programme. 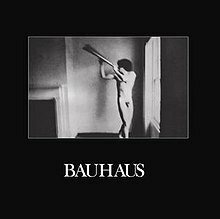 Bauhaus applied to the BBC to use the Peel sessions version, but due to obstructions from the Musicians Union, the process took over a month. For journalist Andy Gill, the dark atmosphere of the record was reminiscent of previous works by groups like Siouxsie and the Banshees, Adam and the Ants, and Joy Division. In his AllMusic review, critic Ned Raggett described Bauhaus as a "glam-inspired rock band", said that singer Peter Murphy channeled both Iggy Pop and David Bowie, and compared Daniel Ash's guitar playing to Mick Ronson's. Raggett noted that the album concluded with "a dramatic ending" with the song "Nerves". In the Flat Field was released on 3 November 1980 by record label 4AD. It was met with a negative response from critics, but topped the UK Independent Albums Chart and made the UK Albums Chart for one week, peaking at No. 72. The album was first released on CD by 4AD in April 1988, with eight bonus tracks including three non-album singles: "Dark Entries", "Terror Couple Kill Colonel" and a cover of T. Rex's "Telegram Sam." Five of these bonus tracks had been previously compiled on the 4AD EP in 1983. On 19 October 2009, 4AD/Beggars Banquet reissued the album as an "Omnibus Edition", featuring the 24-bit John Dent remastered CD of the original nine-track album in a replica mini-LP sleeve (with corresponding inner sleeve featuring the lyrics), plus a 16-track bonus disc of singles, outtakes, alternate recordings and original versions. The set came inside a semi-long box, coupled with a 48-page book that included comments from band members, photos, complete lyrics, complete tour date information for 1979 and 1980, and an essay by Andrew Brooksbank on the formation and creation of the band, the singles and the album. While In the Flat Field received positive reviews in fanzine publications, the album was "absolutely slated" by the British weekly music press, according to Bauhaus biographer Ian Shirley. NME described the album as "nine meaningless moans and flails bereft of even the most cursory contour of interest, a record which deserves all the damning adjectives usually leveled at grim-faced 'modernists'." Reviewer Andy Gill then ultimately dismissed them as "a hip Black Sabbath". Dave McCullough of Sounds was also negative: "No songs. Just tracks (ugh). Too priggish and conceited. Sluggish indulgence instead of hoped for goth-ness. Coldly catatonic." The American Trouser Press, however, described it as "a dense, disjointed patchwork of sounds and uncertain feelings, supported by a pressured, incessant beat. Delving deep into the dark side of the human psyche, Bauhaus conjures up unsettling images of a world given over to death and decay." In his AllMusic retrospective review, Ned Raggett praised the album, writing "few debut albums ever arrived so nearly perfectly formed". while Treblezine described the songs as "twisted, glam-inspired post-punk raveups". AllMusic's Raggett wrote: "In the Flat Field practically single-handedly invented what remains for many as the stereotype of goth music—wracked, at times spindly vocals about despair and desolation of many kinds, sung over mysterious and moody music". In 2012, Sonic Seducer listed In the Flat Field at No. 4 in its list of "10 Key Albums for the Gothic Scene", calling it a work that had shattered outdated ideas of rock music. Music author Dave Thompson described it as "one of the most courageous albums of the age." Louder than War noted it as "a staple record for the true post-punk scene". All tracks written by Bauhaus (Peter Murphy, Daniel Ash, David J, Kevin Haskins), except as noted. Note: In Canada, the single "Telegram Sam" was included as track 2 on side B. Credits are sourced from the liner notes of the original release. ^ a b c d e Raggett, Ned. "In the Flat Field – Bauhaus". AllMusic. Retrieved 22 February 2013. ^ Shirley 1994, p. 43. ^ a b Gill, Andy (8 November 1980). "Gothic As a Brick". NME: 32. ^ a b Shirley 1994, p. 46. ^ "Bauhaus | Official Charts Company". Official Charts. Retrieved 28 March 2015. ^ Brooksbank 1997, p. 150. ^ Brooksbank 1997, p. 164. ^ Gourlay, Dom (27 October 2009). "Bauhaus Re-Issues: In the Flat Field and Mask Omnibus Editions Reviewed". Drowned in Sound. Retrieved 22 February 2013. ^ Hansen, Skaht. "Bauhaus: In The Flat Field". Pitchfork. Archived from the original on 16 August 2000. Retrieved 29 May 2017. ^ "Bauhaus: In the Flat Field". Record Collector: 91. 2009. Musically, this is a timeless statement of dark, magnificent metal prowess and clarity. ^ Shirley 1994, p. 44. ^ McCullough, Dave (8 November 1980). "All Angst and No Play Or: The Yawning Pitfalls Confronting Young Modernists". Sounds. ^ Grant, Steven; Robbins, Ira; Fasolino, Greg. "TrouserPress.com :: Bauhaus". Trouser Press. Retrieved 28 March 2015. ^ Gnuch, Kym (2012). "10 Alben mit Schlüsselcharakter für die Gothic-Szene". Sonic Seducer (in German) (Special ed.). ^ Thompson, Dave (1 November 2002). The Dark Reign of Gothic Rock: In the Reptile House with The Sisters of Mercury, Bauhaus and The Cure. Helter Skelter. ISBN 9781900924481. ^ "Bauhaus: godfathers of Goth or the ultimate post punk band – an appreciation". Louderthanwar. Retrieved 1 April 2015. ^ In a Flat Field (Liner notes). 4AD. 1980. CAD 13. Brooksbank, Andrew J. (1997). Bauhaus: Beneath the Mask. Nemo. Shirley, Ian (1994). Dark Entries: Bauhaus and Beyond. SAF. ISBN 0-946719-136.